After an awesome congee breakfast, we were walking along Jervois Street back to our hotel to check-out, and sighted Barista Jam! So obviously we must try the coffee here. But besides coffee, Barista Jam’s menu also includes breakfast, pastries, pastas, salads, and sandwiches, and serves them in a cozy, chic place with friendly baristas. Most of Sydney’s markets are unlike Melbourne’s Queen Victoria Market or South Melbourne Market which are fixed buildings and stalls operate from within the building and around the peripherals of the building. Instead, most of them are temporary in nature and often make use of school compounds to stage the marketplace during weekends or designated days of the week. Markets also differ in nature where some are dedicated to just food, like The Rocks Friday Foodie Market, others are more varied which could include fashion, accessories, art pieces of various forms (paintings, carvings, ornaments etc. ), furniture, and daily tools and accessories. This was a beautiful morning and we were walking along George Street to The Rocks when we suddenly noticed a queue forming outside The Galeries. We had a close look and there are a few communal tables inside and they sell a limited amount of sandwiches and pastries. A bit of Googling revealed that they also happened to be a popular coffee joint! I of course could not miss this opportunity of another skinny Latte (A$4) to go! 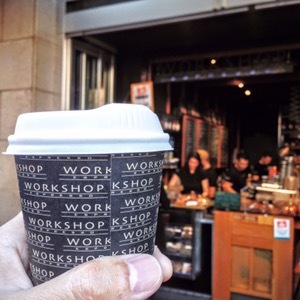 Opened since 2009, Workshop uses top notch single origin beans and has been the favourites of office workers around the CBD area who can be seen queuing up at all times to get a cup in their hands. The coffee was fragrant and full of body and really pecked us up while we continued our walk to The Rocks for the The Rocks Friday Foodie Market! Since we only had a Matcha Latte take away (check out the cup on the table) from the small Cafe Cre Asion, we decided to turn at the corner into Commonwealth Street and landed on Joe Black Cafe which had a good rating on Google. The cafe was very cozy and warm with a very community feel to it. On one of the walls (where we were seated), there was a drawing of a train map that became a very interesting talking point for its customers. We especially loved the warm hospitality of the servers as they get around to take our orders, fetched and topped up our tap waters. The whole lively vibe of the place just boosted our level of likeness for Sydney on a whole! At every city that I travelled to, I would make it a point to visit their local markets. Be it Taipei, Hong Kong, London, these are the places that fascinate me and get me excited all the time, where you can witness how the locals go about their daily living and mingle yourself in the buzzing vibes of the market. On every trip I made to Melbourne, Queen Victoria Market or QVM is the must-go place. And during the winter months, QVM also host the Winter Night Market every Wed night for 14 weeks. We were lucky to detour to the Winter Night Market before our expensive Japanese dinner the other day. There were fireplaces strategically located throughout the shed area and over 30 street vendors and some of Melbourne’s best designer and artisan stalls made up the lively place where people just gathered, had fun and enjoyed great food and company! After a satisfying coffee, we continue to walk along Elizabeth Street in the direction of Queen Victoria Market in search of yummy breakfast on Google. That’s when we stumbled upon this description Artisanal donuts and organic coffee in a snug space with chic, minimalist decor, plus takeaway. How can we not be moved by such a description? And so we strolled into the small Sutherland Street and found this quaint little cafe with only 2 small tables inside, and many customers standing outside sipping hot coffee and munching on deliciously-looking donuts! Kinda reminded us of Ah Zong Mee Sua (阿宗麵線) in Ximending, Taipei. We slept in today because we had a long day at Phillip Island yesterday, and only ventured out after 10am. We were just walking along Elizabeth Street, trying to find something to munch. And we passed by Brother Baba Budan again! This time, I didn’t miss the chance to walk in and got myself a skinny Latte (A$4) to go since there weren’t much pastry choices and we were going to Queen Victoria Market later. And boy, this was the best coffee I have had so far in Melbourne! Directions: Take the (free) tram to Burke Street Mall and walk along Little Burke Street. After a visit to National Gallery of Victoria, we decided to take a stroll (~30mins) to South Melbourne Market (since it’s on the same side of the river). It was a good exercise for us since we had such a filling breakfast and good time to catch up with each other as we chatted along the walk. I have been to Queen Victoria Market every time I was in Melbourne, but had never come to South Melbourne Market. Google describes it as a Lively indoor market with stalls for produce, meat & seafood & cafes serving global fare. The market has been opened since 1867, and will be celebrating 150 years next year! It is the quintessential village market, a place where people come not only to purchase fresh food, but to meet, eat, drink, shop, discover, share and connect.